Thomas J Price, Frieze Sculpture 2017, installation view, Photo Charlie Littlewood. Image courtesy of the Artist and Hales Gallery. Copyright the Artist. Thomas J Price, Untitled (Icon 1-5) group view, 24 ct gold leafed aluminum composite, Italian slate base on quartzite plinth, 2017. Image courtesy of the Artist and Hales Gallery. Copyright the Artist. Thomas J. Price, Material Visions, 2016. Aluminium composite, palladium, concrete, felt, 22.2 x 11.2 x 14 cm. Image courtesy of the Artist and Hales Gallery. Copyright the Artist. 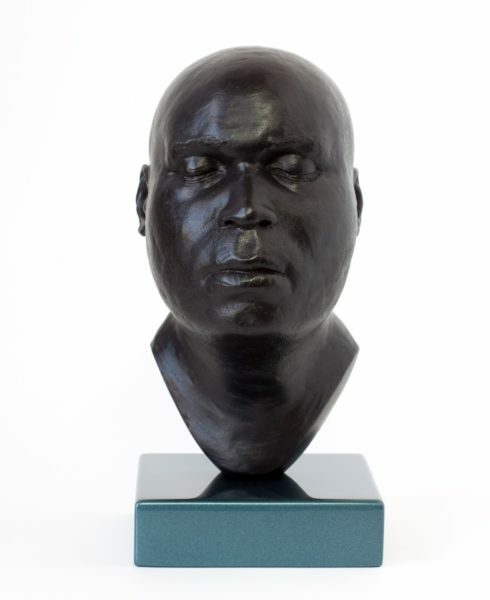 Thomas J Price, Head 18, (front), 2014, Bronze, Perspex & Automotive Spray Paint, 20x11x13 (base 3x11x11cm). Image courtesy of the Artist and Hales Gallery. Copyright the Artist. Thomas J Price, Head 18, 2017, acrylic composite, perspex and automotive spray paint, 19.8 x 9 x 13 cm. Image courtesy of the Artist and Hales Gallery. Copyright the Artist. Thomas J Price, Mental Structure 19, 2017, acrylic composite, perspex and automotive spray paint, 19 x 10 x 11 cm. Image courtesy of the Artist and Hales Gallery. Copyright the Artist. Thomas J Price, Network, 2013, bronze, 274.3 x 100 x 92.1 cm. Image courtesy of the Artist and Hales Gallery. Copyright the Artist. 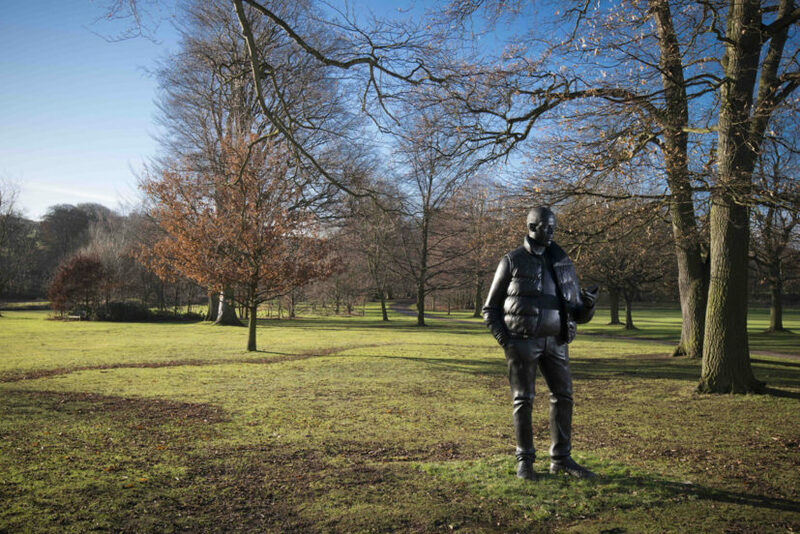 Thomas J Price, Network, 2013, installation view, Yorkshire Sculpture Park, photo Jonty Wilde. Image courtesy of the Artist and Hales Gallery. Copyright the Artist. Thomas J Price, Sportswear (Achilles Street), front-small, 2011, Bronze, Perspex, 175 x 36 cm. Image courtesy of the Artist and Hales Gallery. Copyright the Artist. 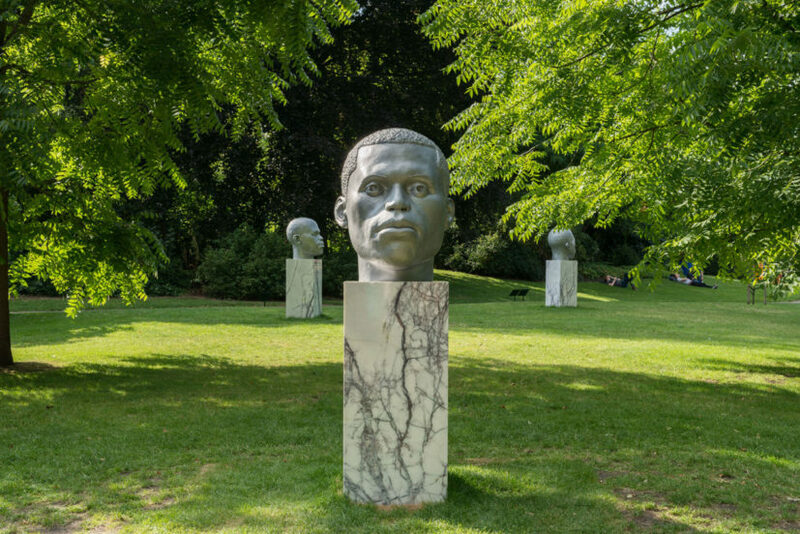 Strolling through the historic gardens of Regent’s Park, the pathway comes to a fresh green lawn where three aluminium heads stand on marble plinths. All three heads are looking out in different directions, two outwards to the rest of the park, the third stands resolutely towards the entrance. A group of girls have planted themselves in the middle laughing at their phones, whilst a man is leant up against the side of one of the plinths, his concentration lost in a book. 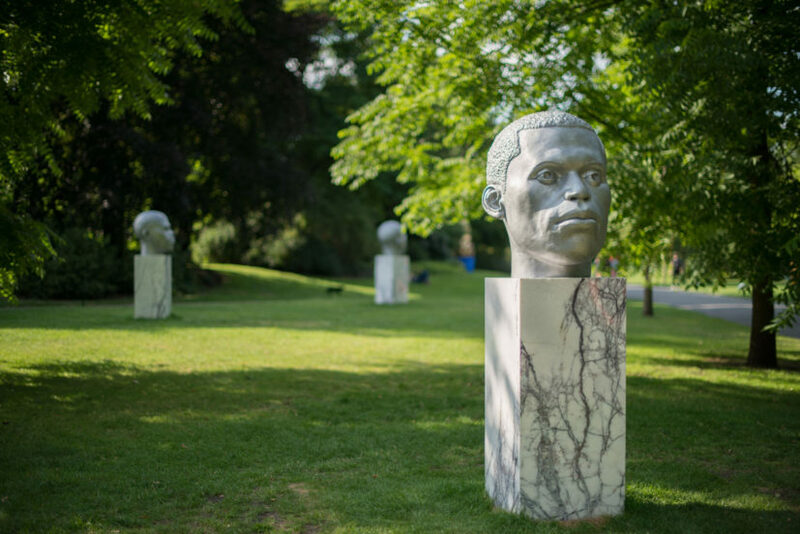 Part of this year’s Frieze Sculpture Park, Thomas J. Price’s sculptures Numen (Shifting Votive Three), 2016, tenaciously stood their ground. ‘Numen’ means the spirit or divine power presiding over a thing or place and at Frieze this year, the sculptures did just that. 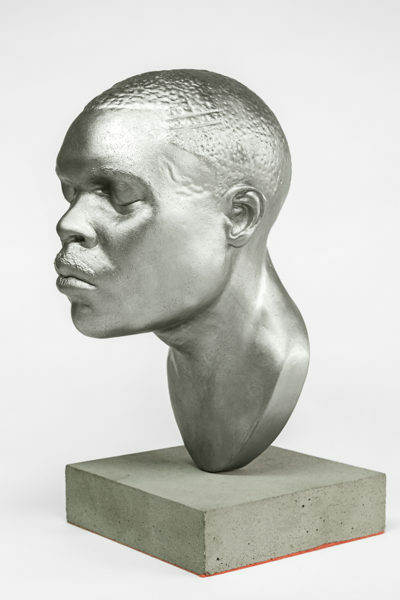 On their plinths, each head about 60cm wide and 70cm high, meet the viewer at standing eye level, drawing one closer to study them and their features. There is no stiff Roman nose or a mushroom mop of hair; instead here are men with inherently black features. 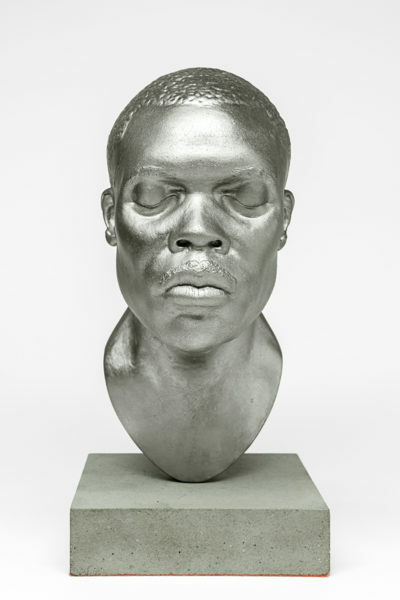 Through sculpture, moving image and photography Price has attempted to push at the subconscious social boundaries around the image of black males in society. 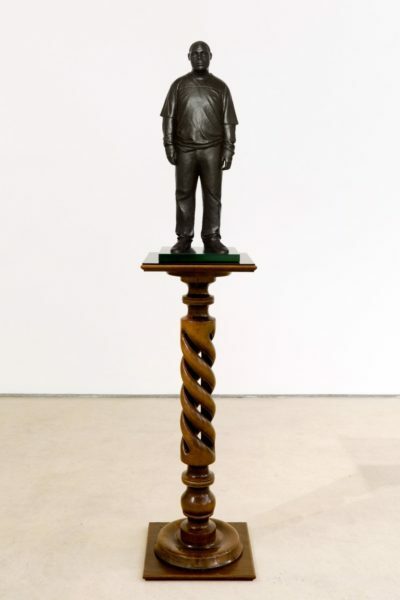 His sculptures vary in sizes from towering nine foot figures to single heads on plinths. All these characters are casual, unassuming yet given centre stage in their various outdoor public locations that are dotted across the UK; The White Collar Factory on Old Street, Yorkshire Sculpture Park and The Line sculpture walk, east London. 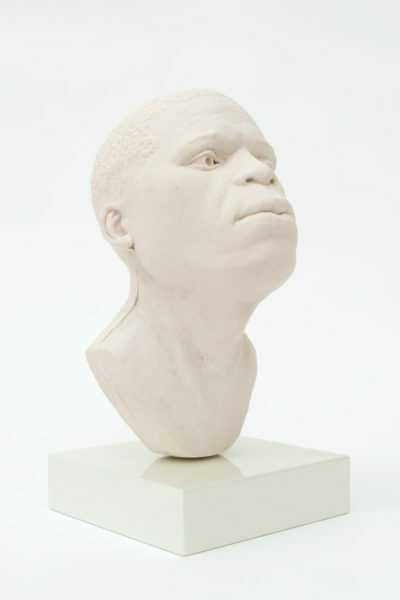 The race and gender of these sculptures, is a subject that Price brings to the forefront. The streets of London are crammed with commemorative statues of victorious white men on plinths looking gallantly into the distance. Men from a time that does not connect to the attitudes we share today, nonetheless, these figures form the backdrop of our everyday lives. Since the classical period western white male artists have grappled at abstract ideas of machismo in their art; tall plinths, fine casting materials. The image of the black man, however, has undeniably not had the same treatment by these artists. 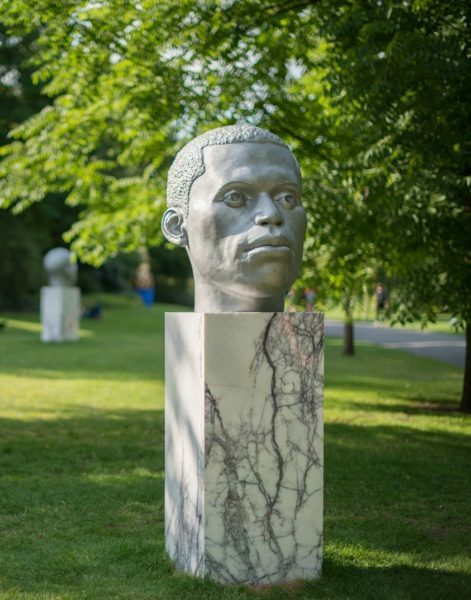 Price employs a variety of materials in his practice including marble, bronze and aluminium, in order to comment on ideas of status. Materials such as bronze and marble are laden with connotations of value, harking back to those used in classical iconography and more modest materials such as aluminium are commonly found in our modern day lives. 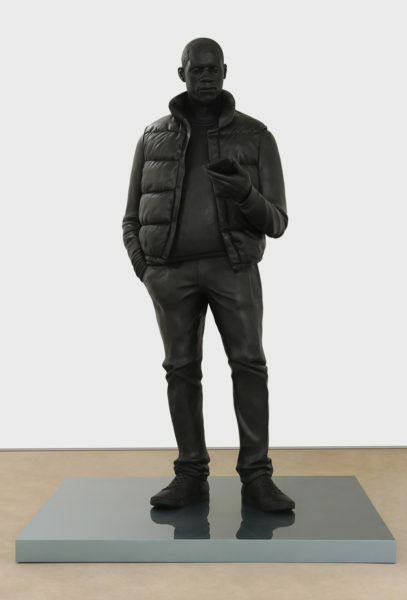 The male figure in his bronze sculpture Network, 2015, wears baggy jeans and a puffer jacket and is gazing down at the phone in his hand whilst standing in a rather relaxed contrapposto slouch. Surprisingly, the life-like characters created by Price are not modelled on real people but are all fictional composites, psychological portraits, given birth by Price’s imagination. This feature adds a more abstract dimension to his work, telling us that these aren’t important heroes of war but are simply normal people, men who look like us, who live around us. Furthermore, he is also questioning the socially constructed idea of race in society and the demonization of black youths in the media. Visual culture is filled with negative perceptions of black men wearing sportswear, playing music off their phones; Network highlights the inoffensiveness of these everyday individuals by placing them back into the public sphere. It is very welcome that Price opens up a space to contemplate the images we have of black men in visual culture. When viewing his work we can reflect on why this subject still requires discussion in today’s multicultural society. Thomas J. Price (b. London 1981) received an MA at the Royal College of Art, Sculpture School in 2006 and now lives and works in London. Selected solo exhibitions have been held at prestigious institutions including the National Portrait Gallery (London), Royal Academy of Arts (London), Mac Birmingham (UK), Royal College of Art (London), Yorkshire Sculpture Park (UK), Harewood House (UK) and Hales Gallery (London). 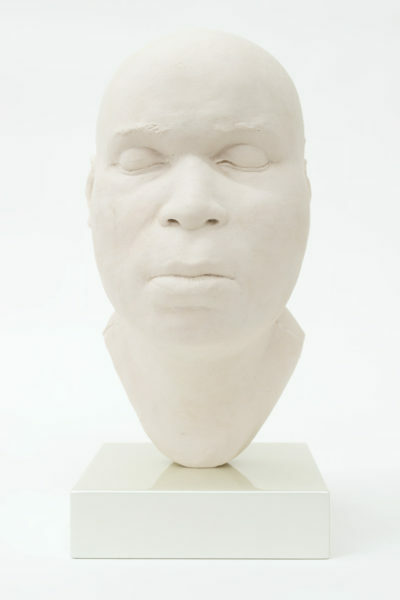 Price’s work has also been included in shows in the US and Europe.